Ligeti was there at $2.50 a pop for a time. Silly not too try it really. You must have seen some of the chaff I generally land myself with for that price. Even at $5 it is a bargain. Miniature IV: Art of Toru Takumitsu (Deutsche Grammophon). A while ago I mentioned Takemitsu’s “November Steps” (cond, Ozawa). Just to recap, this sounds (to me) very Japanese. This largely in that the two main sound sources are biwa and shakuhachi. They engage in a very loose counterpoint with what I take to be a full ‘western’ orchestra (the Toronto symphony). Too loose, really. I spoke before of the snatches of sound I heard hovering distantly in the house. Heard intermittently, they have real beauty. Listened to closely, the pauses between the sounds are too long. Judging from the composer’s sleeve notes he seems to have been making some point about the ‘western’ and the ‘eastern’ not meeting. I think that his success is the audience’s loss. The web tells me that “November Steps” is thought of as Takemitsu’s masterpiece. A later performance is, apparently, better (I see that it is shorter!). It wouldn’t surprise me if the piece was part of what inspired Barry Conyngham’s “Water…Footsteps…Time”. It is streets ahead of the Deutsche Grammophon LP. Two sides of what might as well be random percussion noises. Pick up a copy from your local ‘trades‘ thread and decide for yourself. Listened to closely, the pauses between the sounds are too long .... It wouldn’t surprise me if the piece was part of what inspired Barry Conyngham’s “Water…Footsteps…Time”. The idea of leaving space between sounds underpins a lot of Takemitsu's work. It comes out of the traditional music forms associated with Noh and Kyogen theatre. You find it in some percussion stuff as well. The sound needs to resonate. See Togashi Masahiko for the Jazz version. Not a bad call on the Conyngham. I only have one LP by him and it reminded me of Takemitsu. No wait, Bruce Conyngham? I see the 'Takemitsu' has 'Stomu Yamashta' on it also I assume he is playing prepared piano or percussion as opposed to keyboards? A hard listen as I remember and probably something I'm not quite ready for. I am potentially interested, if you decide that it is for the out. Last edited by Grim Lounge Cowboy; 28-02-2016, 01:34 AM. Reason: Bruce? Is "Noh" music worth investigating? There was a record at the sale. But I reasoned that it would be like lots of soundtrack stuff - best heard in context. I had to wiki it to understand what it is but I'm not so sure with the use of traditional Japanese instruments, westerns ears may interpret it as something else entirely, its something I'm not very familiar with if its cheap give it a go you never know its certainly interesting. Apart from some Cod Japanese music I'm unfamiliar with many of its many traditional forms its not something I come across so that makes it interesting to me personally. I've got the 50s mono DGG version (60s issue) and the 60s stereo DGG, I think one of them is (or used to be) a recommended version. also there's the lesser known "Catulli Carmina" and "Trionfo di Afrodite" although not fully got to grips with them yet. I suspect that you are putting more into it than I do. Beethoven: String Quartet in C Sharp Major, Op 131 - Vlach Quartet - This charity shop find was my first Supraphon album and not a bad place to start from what I can gather. It's a good chunky bit of Czechoslovakian vinyl from 1962 with just the slightest of surface noise and a recording that, while there seems to be plenty of love these days for The Takacs (as recommended by Xann), Busch and Alban Berg (eek!) Quartet versions, does often get a mention as being amongst the best. It even commands a decent price, unusual for anything owned by me. Not that it will be going anywhere in a hurry. Sonovox described the late Quartets as being 'moving and beautiful' and I must wholeheartedly agree. 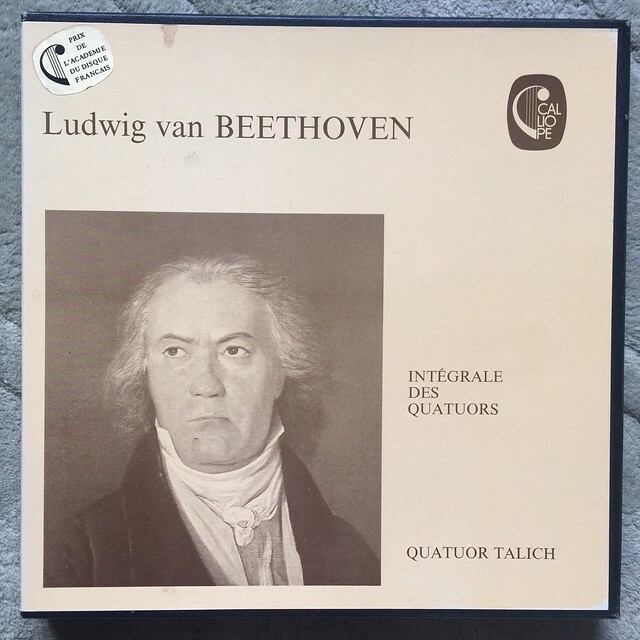 Composed just a year before Beethoven's death, when LVB felt it was OK to break a few of the more usual formal rules, this recording excels I'm told, because the Vlach Quartet had a good understanding of the new way that Beethoven wanted to work. Their playing and richness of tone certainly convince. The music really is wonderful; pure sweetness shot through with veins of melancholy. In critic speak this generally heralds the entry of the 'n' word - 'nostalgia', and while there's a certain logic to that, it somehow doesn't say enough. Of course it's tempting to see it that way knowing LVB's circumstances, but humanity and artistic expression are rarely so 'A,B,C'. This is music so much more subtle than that; this is not a man merely looking back on his life and loves with a wistful tear in his eye and an ounce or two of regret in his heart - sure it's all that, but it also lives in the moment, it has the odd pause for self effacing humour (witness the occasional well placed single pizzicato notes), it flits from thought to thought, memory to memory, revels in the occasional moment of glory during the allegros, allegrettos and prestos and I daresay affords itself the odd wry smile as LVB considers how those around him may carry on when he's gone. Not so much nostalgia, more joyful resignation. Bartok: String Quartets Nos. 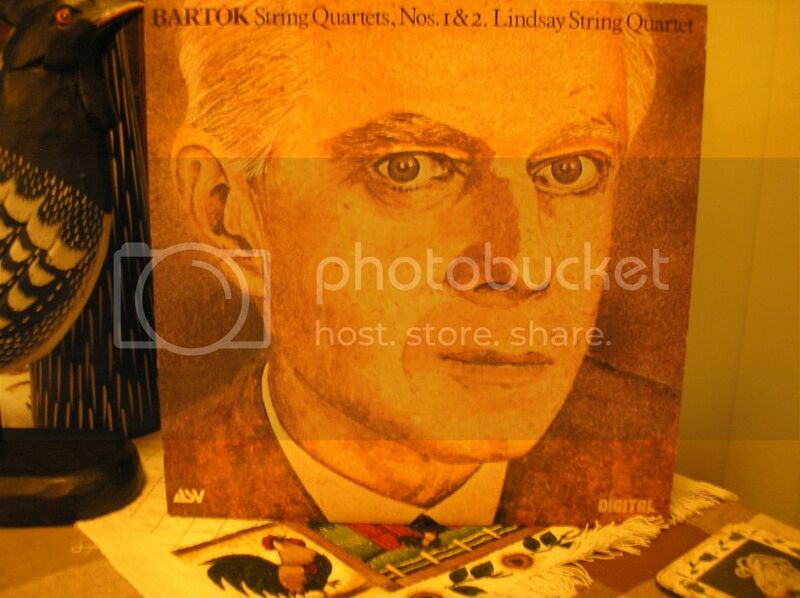 1 & 2 - Lindsay String Quartet - I'd heard good things about Bartok and keen as I am to get a better knowledge of 20th century composers picked up this 1981 digital recording on ASV in a charity shop. Seems I'd fallen on my feet again; the condition of the record is excellent and the quality of the recording is superb, with a warmth of sound and clearness of separation that's rare in any genre and again, it's a highly rated interpretation. I was a little wary of the works to begin with - Bartok's first two string quartets were written roughly at the same time as those of Alban Berg which I didn't get on too well with. (In fact today, I revisited the Berg to see if I'd get on any better with it - I didn't - and actually thought in retrospect that I'd described it quite well...) Admittedly, Bartok's quartets didn't grab me right away. The sleeve notes say that they are often compared to Beethoven's but that wasn't instantly apparent to me. While they're not as obviously hamstrung by dodecaphonics like Berg's, the music does seem to work within certain tonal boundaries, but these seem somehow more wide ranging and, unlike Berg, fully explore the range offered by the instruments. Bartok loads his work with counterpoint and while one might discern a connection with Beethoven in the fugue sections and lentos generally, it's a kind of remixed, almost digitised Beethoven. There's also much more obvious drama in these works as one might expect from a younger man in a more modern age. Those single pizzicato notes of Beethoven might here be four or five or six, there's rather more dissonance and the pace can pick up so vigorously you sometimes half expect a wah-wah guitar to kick in and a car chase to break out. This, I suspect, may be the influence of traditional eastern European folk music on Bartok's work. The lentos carry that same sweetness shot through with melancholy, but with nothing approaching the life evaluating profundity of Beethoven, more akin to the sun occasionally breaking through the clouds to tease you on a damp and grey day and as quickly disappearing again. All that said, I'm finding Bartok to be a bit of a 'grower' and repeated listenings are revealing more to my ears each time, so there's a good chance I might explore further, especially if the Lindsay String Quartet are involved. Only a year? It seems much longer! 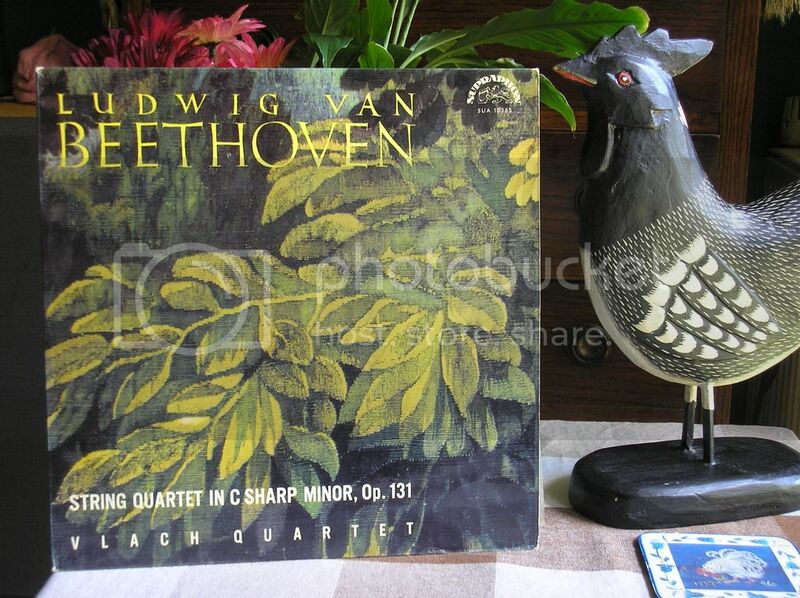 I think I also said early in the thread that I was going to keep on picking up versions of the Beethoven quartets, which I have been doing, and funnily enough I found my first complete box set of all 16 quartets on 10 LPs a couple of days ago - bargain at a tenner from Oxfam. In the interim I have also listened to two complete Beethoven symphony cycles (plus some individual ones), started accumulating the piano sonatas in different versions, and so on. The "early" and "late" Beethoven quartets are great. I've been buying the Quartetto Italiano versions on Philips, but have also been eyeing up the Supraphons. There's plenty of discussion of the quartets online and lots of recordings out there. Supraphon is a lovely label, always tempted by a red label stereo pressing. Lots of great sleeve designs, nice pressings, usually pretty cheap. I always forget how angular and "modern" Bartok can be, sort of have him mentally pegged with Dvorak. There are 6 string quartets I think - I've got the Juilliard Quartet on CBS, and one volume (5&6) by the Novak on Philips. Also the piano concertos (1 & 3) seem to be common recordings, have several of those, plus the Percussion and Celeste piece (have 2 versions but don't think I'm keen on this piece) and the Concerto For Orchestra (much better), got the HMV Kubelik recording on a WRC reissue. Also got a viola concerto on Supraphon. The areas I mostly look for are: early/mediaeval/renaissance, baroque, string quartets and chamber music, especially cello, and late C19th/early 20th orchestral, and there's usually quite a lot on Supraphon that fits the bill. Not sure I've heard a great cellist on the label yet though. And thanks for the detailed reviews, I can never really put music into words beyond things like "great"
Might post up some Supraphon favourites, but it would just be a photo gallery. Just realised I have a Czech copy on 'Supraphon'. Thanks for the the props its been an interesting, educational and entertaining thread glad its given some pleasure. Cheers GC! 1 year my how time flys, tip of the hat to Treeboy' who urged me to start it off.